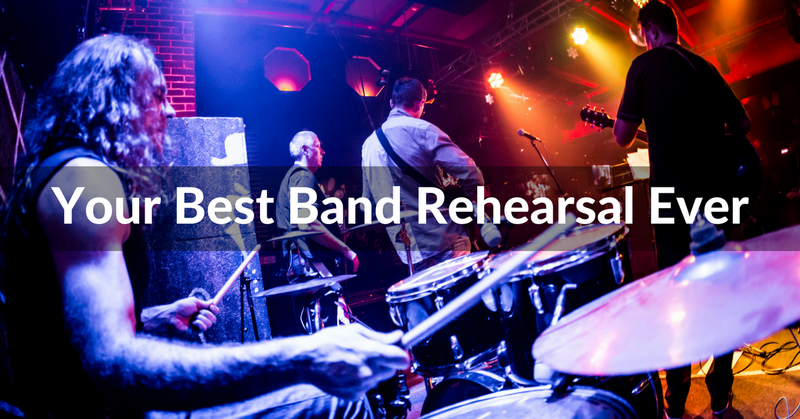 When it comes to band practice, practice only makes perfect if you use your time efficiently. Many bands get together with the initial intention to practice for a few hours, but get distracted and goof off, resulting in little or no progress. And other times we end up just playing what’s comfortable instead of pushing boundaries and improving as a group. Maybe you have a show coming up, or are rehearsing your new songs for an upcoming recording session. Either way, you need to use your time together to push yourselves forward as much as possible. Here are 4 ways you can improve your band practice sessions. Knowing what you’re getting into before you start can help you jump right in and maintain focus throughout your time with your band members. Getting together for jam sessions or to go over old songs is great, but ask yourself if this is really going to push your band forward. Know what the point of your practice is before you even get together. Do you have an upcoming show? Are you preparing to record your album soon? What songs do you need to know? Where are you currently struggling? Figure out what you need to accomplish and double down. Learn more ways to make the most of your time in the rehearsal room and beyond. Download the free ebook: The Musician’s Guide to Getting More Done. A common problem in band practice sessions is that band members get together and lose sight of their goals. Distractions get in the way, and time ends up being used for unproductive tasks. Don’t try multitasking. It doesn’t work. There’s a difference between hearing and listening. If you hear someone, you’re often paying attention to the specific words they’re saying rather than trying to understand what it is they’re attempting to communicate. Listening, on the other hand, is focusing your efforts on understanding the message of the communicator. If you and your band members can focus on trying to understand what each other are trying to communicate while speaking, practice sessions will be much more efficient. If you don’t fully understand what a band member is saying, keep asking questions and dig for more details until you get it. Human beings can only fully focus for so long, so it’s important to take breaks. When you feel that you’re becoming more easily distracted and are more prone to mistakes, maybe it’s time to stop for a while. Take 15 minutes to grab a snack, hang out with your band members, and discuss what you’ve accomplished so far. Be sure to keep your breaks short. Set a timer, and when your break is over, get right back into practicing. During your breaks, don’t do things like social media or video games that can pull your focus away for long periods of time. Time management is one of the most important skills you can develop as an indie musician, and deciding where you need to focus your efforts so you can get more accomplished in less time is a big part of the New Artist Model. Check out the full New Artist Model Essential course, or get started for free with a free download of my ebook Hack the Music Business.